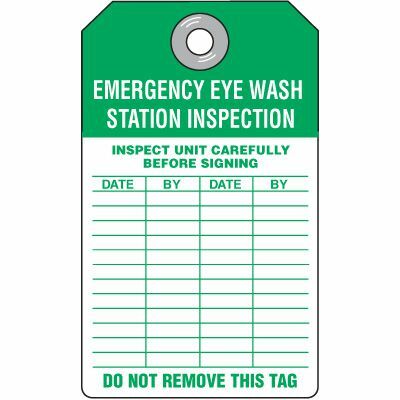 Emergency eyewash station tags provide accountability for the inspection of emergency eyewash and shower equipment. Durable 3/8" metal grommet prevents tearing at the point of attachment. All the guidance you need is provided below. If you need further assistance, please call 1-800-243-6624 and one of our product experts will guide you to the right solution. 15 Mil. Plastic:For prolonged indoor or outdoor use in standard conditions. 30 Mil. Heavy Duty Plastic:For prolonged use in harsh indoor or outdoor conditions.